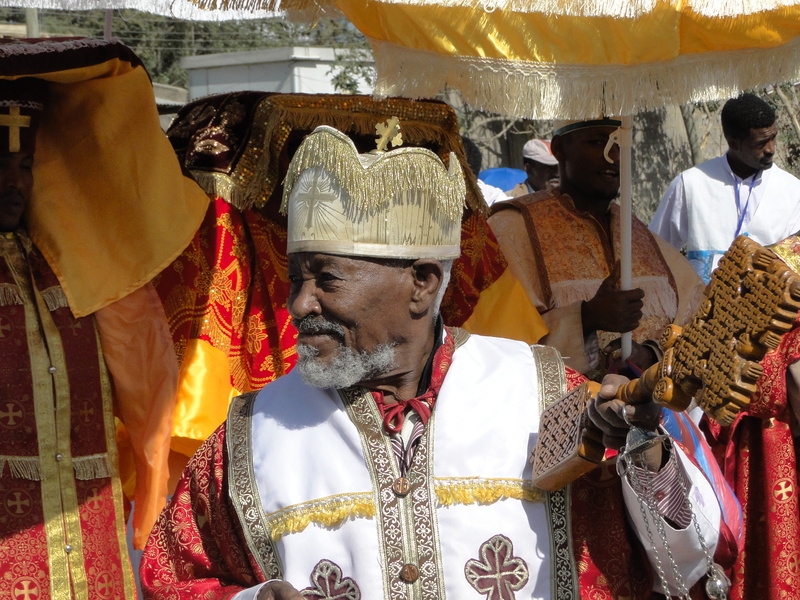 Tomorrow is Ethiopian Epiphany, known as Timkat. The city is getting ready for the celebration, one of the most important in the Ethiopian calendar. Everything stopped after lunch today, offices and businesses closed early to let people go to their local church. Epiphany is a very religious ceremony, celebrating the baptism of Jesus Christ. On that occasion, priests from each orthodox church wear their most ornate robe, carrying the cross and the Ark of Covenant, to march in a procession through the city. As they proceed, followers join in, quickly taking over the streets of Addis. 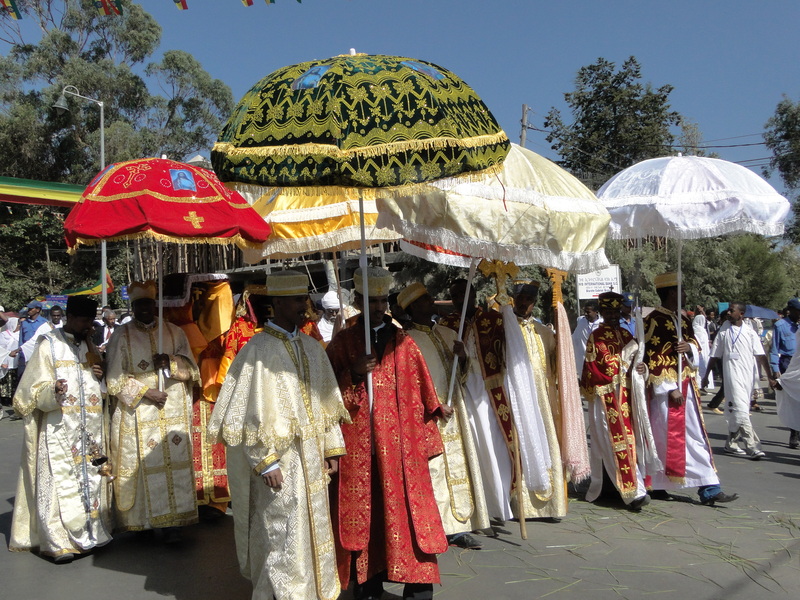 They are walking towards an area called Jan Meda, north-east of the city, where the Patriarch of the Ethiopian orthodox church will bless them with holy water on Epiphany day. Jan Meda is the largest enclosed open space in the city, used for religious gatherings as well as sport games. On the eve of Epiphany, the whole city comes to a halt, as most Orthodox are preparing to receive their blessing. I went to the nearest church in my area to witness the procession and was surprised by the relaxed and peaceful atmosphere I found. People seemed to genuinely enjoy the moment. They were chanting and singing to the sound of a traditional drum. 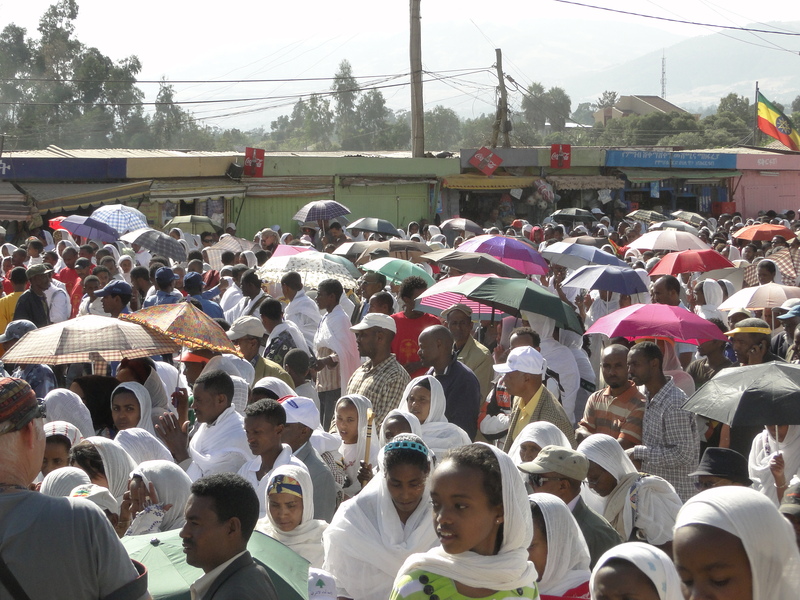 Women were wearing the traditional white Ethiopian dress and had their hair covered by the matching shawl, called netela. During religious ceremonies, women cover their hair and pull the upper end of their netela on their shoulders to form a cross. Very few men were wearing the full traditional outfit, some of them just had a white shawl over their shoulders. The police was there to keep things in order, and walking around as an outsider I didn’t feel any aggressive stance either from the police or the crowd. On the contrary, people were very friendly and smiley. 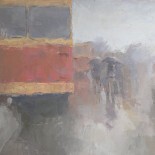 This entry was posted on January 19, 2012 by Salambo in Living in Addis, Religious Ethiopia and tagged Addis Ababa, epiphany, Ethiopian epiphany, jan meda, netela, procession, timkat.